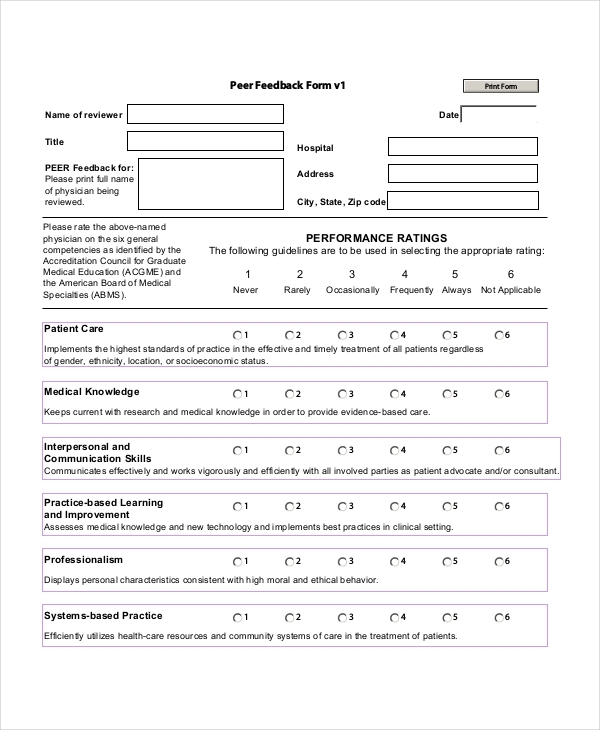 The peer review feedback form discusses the work they have done. The members would discuss every aspect of the form like organization, content, style and writing, grammatical error etc. They are properly checked and conveyed to each other. To help improve a classmate, this form can be used. Feedback regarding the content, voice, body language is required. There is a space for other information and immediately after that there are a few questions about public speaking skills. The form is beneficial if the classmate writes down all the answers without any bias. You can download these forms for free through our website. 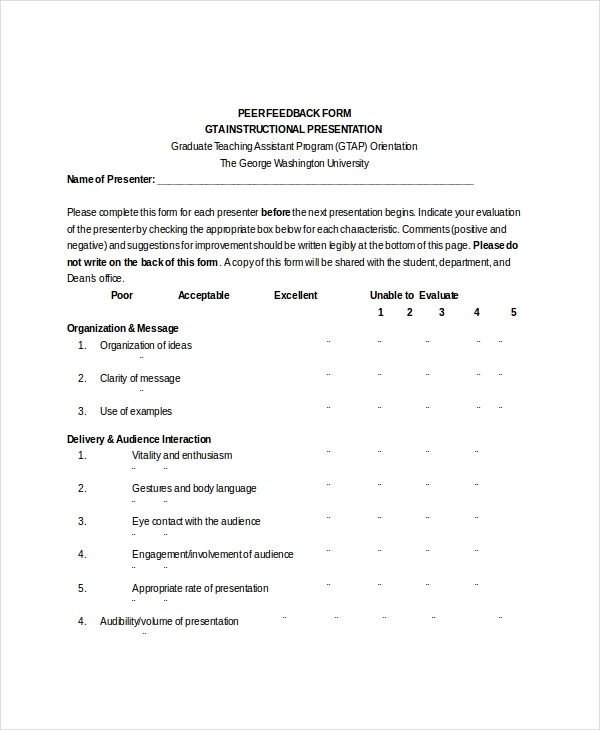 Graduate Teaching Assistant Program issues a peer feedback form that is to be filled by the presenter. The form has questions about the organization, language skills, audience interaction, delivery, and overall effectiveness. There is a space for an open question as well so that feedback can be written in a better way. 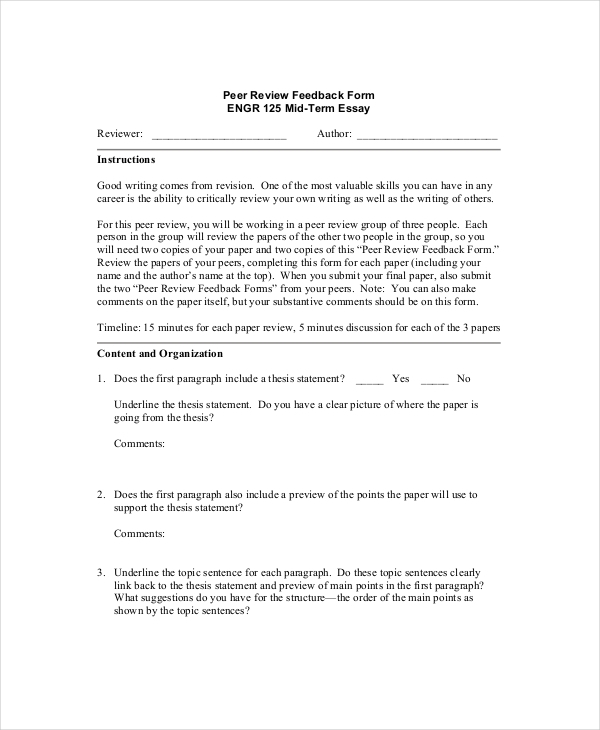 The higher education peer feedback form is used for assessing the presenter’s content, style of presentation, site description, improving the poster etc. This form is easily available for free download so that there is no difficulty in future sessions. A space for positive feedback is also available to let the person know about the strength as well. 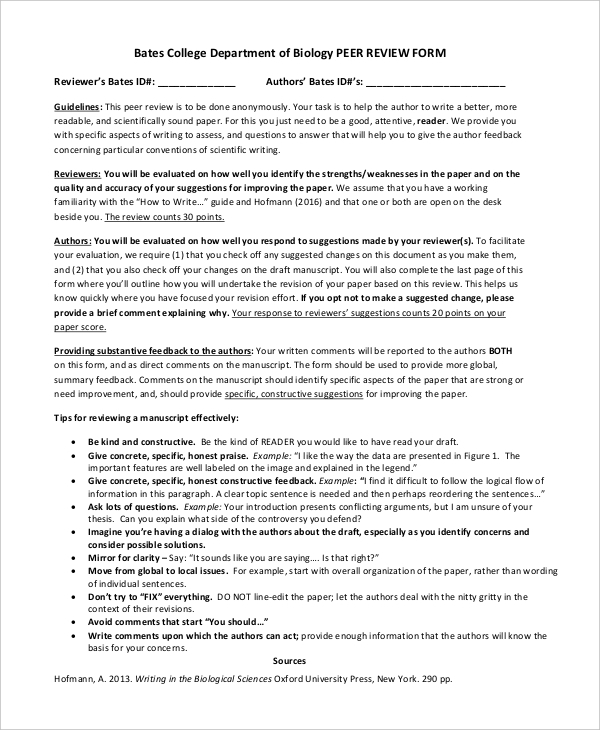 To assess a peer review paper, this form would be useful. The form asks about the various aspects of the paper like the introduction of thesis, strategies, development of the content, paragraphing, style of the thesis, grammar and punctuation, quotes and various other things. The form is for a research draft which is studied carefully. The form is analyzed by the presenter and modifications are done accordingly. 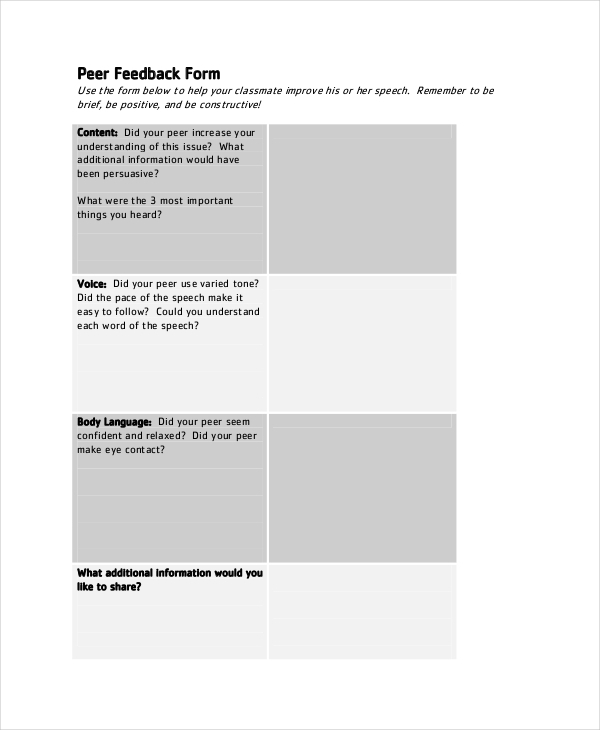 The CTE Microteaching peer feedback form helps to improve the teaching process. The forms are filled in a descriptive way. It has structured questions, asking for suggestions and ideas that can be incorporated in a lecture session. Changeable actions would be taken if necessary. This peer review is done anonymously. The mission is to help the author write a better paper. This requires proper attention to assessing the person. 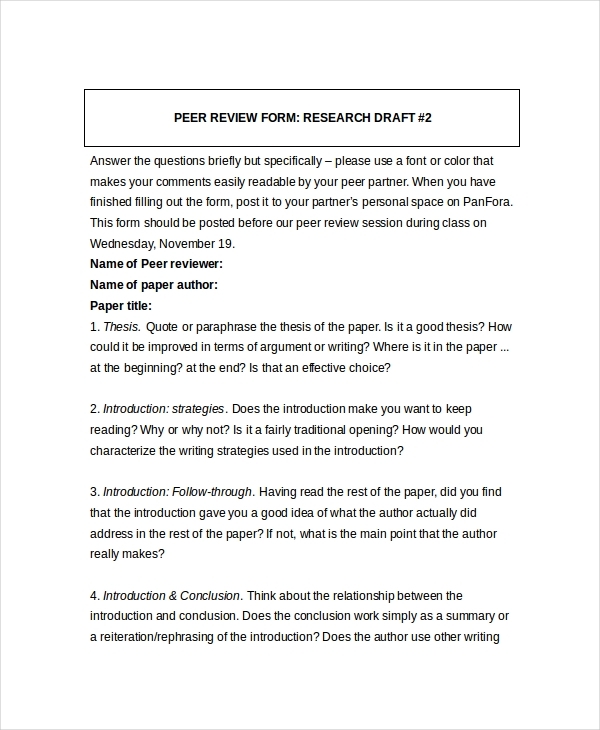 Various tips are given at the beginning of the form so that the reviewer, author, and other people connected to this form have a clear understanding of the process. It creates diversity towards a new way of learning. Instead of having a feedback from a superior, this will be the new way to learn things from each other. This will also be a non-traditional way of learning new things. The peer group member will know about themselves through a different perspective rather than just the senior authority. In this way, the anxiety levels are lower and motivation is higher as well. Peer feedback allows better communication amongst the peer group. They start to know each other through this process. It builds confidence and has the ability to strengthen the communication skills even more. The process also helps in doing an assignment very responsibly. They have to be sure that they read others assignment cautiously too. This gives them an additional boost that they are doing something worthwhile leading to efficiency in work. According to some studies, the feedback helps in cognitive, social, and methodological intelligence. They also get more drive to do more work due to the praise and positive criticism. The peer feedback also helps ESL (English as a second language) students. They are more aware of their mistakes through their friends and have the drive to correct them as much as possible. This not only helps in speaking but writing English as well. By highlighting the positives, we do not mean that there aren’t any negatives to it. There are certain limitations to it as well. A study found out that a feedback from higher authority will lead to better effectiveness rather than peers giving a feedback. This is because we have a tendency to respond to the higher authority better than listening to the peers. Peers giving feedback may also lead to a clash of ego. This makes it a difficult task for the peer group member to learn from each other. Additionally, some students do lack the ability to give sufficient knowledge to their peer. In such cases, the peers hardly learn anything from each other leading to no improvements whatsoever. The peer feedback form needs to be filled very honestly. A biased review will not help the peer group member. Incorrect form filling will only lead to misleading information about the person. All the forms must show realistic reasons for the review points. There may be times when the scoring or marking has been done without any prior knowledge. This must be avoided at any cost. Not doing so may lead to misjudgment of the person in question. The forms are not confidential as it is a tool to discuss the strength and weakness of the person. Peer feedback is always a two-way process. If the person is not ready to learn from the feedback, there would be no scope for improvement. The feedback forms are some of the best ones to know the self in a better way. It is quite difficult to find these forms physically nowadays. If you are looking for a good sample feedback form, then we are here to help you out. The forms are available on our website so that you can download them at any time you like. You can edit and print them as well. The forms are available in Word documents and PDF format making it easier for you to download them in any versions. The forms are made very carefully to suit your needs. They have a high success-rate and are compatible with higher and lower versions of the file. These forms can be edited by you but if you still need further customization, you can tell us and we would do so without any qualms. Make sure you click the download button to get the best sample forms.